PlayBox Technology has chosen NAB 2014 as the launch venue for the latest version of its AirBox server. 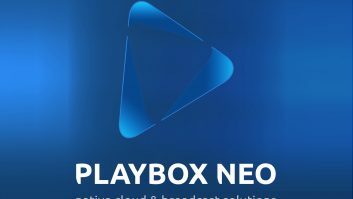 PlayBox Technology has chosen NAB 2014 as the launch venue for the latest version of its AirBox universal playout and streaming automation server. AirBox provides automated content playout for satellite channels, cable head-ends, over-the-air broadcasters and corporate TV users. An AirBox server delivers the same quality video and audio via its single or multi-channel SDI outputs at a fraction of the price of a digital videotape player, the company claims. Features include multi-language audio, graphics and subtitle insertion, last-minute playlist changes and clip editing. In automated playout mode, AirBox allows fixed-time scheduling for weeks ahead. Gaps or time overlaps in a schedule are automatically resolved to ensure continuous operation even when conflicting timed events are present. The server can be used for live production as well as automated playout.